How long would it take to solve world hunger? How long would it take to solve world poverty? Well, we’ve been working on it for a zillion years and we haven’t solved it yet. What’s the core of the problem? What’s the reason? Why hasn’t it been solved? In my humble opinion, it’s because we keep giving a man a fish and we never teach him how to fish! Is it because he doesn’t want to learn, or is it because we keep giving him a fish because it makes us feel good? After a while, he thinks “I’ll just keep accepting these fish, it’s very nice of them to do that. By the way, my neighbor is hungry too, I wonder if you’d have some extra fish tomorrow for him as well as for me?” So, the world’s solution to poverty and hunger is keep giving a man a fish. We’ve got plenty, we can overproduce, we can have our excess go to the hungry and that will solve every problem. And we will feel good. And their government will be pleased. Will this situation ever change? Will they ever get un-hungry? Never. Not doing what we have been doing. Up until now, we had no alternate solution that was feasible, practical and sensible. The world’s solution was that those that were in the know and had the resources would go into a poor country and teach them how to do our method of agriculture. We’ve done it from our country for a zillion years and we’re still doing it. We’re sending them genetically engineered seeds to produce more crop. We’re giving them better fertilizers all the time, to improve their yield from their meager soil and land. We’re convincing them that they need the finest machinery that we have, and that they should plow up the land, as little as they have and as poor the soil is, enrich it with the best fertilizers we can produce, plant the most productive genetically modified seeds and farm just like we do. That’s our solution. It worked for us didn’t it?? Why shouldn’t it work for them? The problem is, it won’t work in a 3rd world country. They don’t have the money, the knowledge, the experience, the land, they don’t have anything! Well, then we’ll teach them to garden – the old fashioned single row method like the Victory Garden. Well, some of us finally realized that’s no good either. It’s wasteful, harmful and at odds with the environment. But now, we have a new method. Made in the USA. 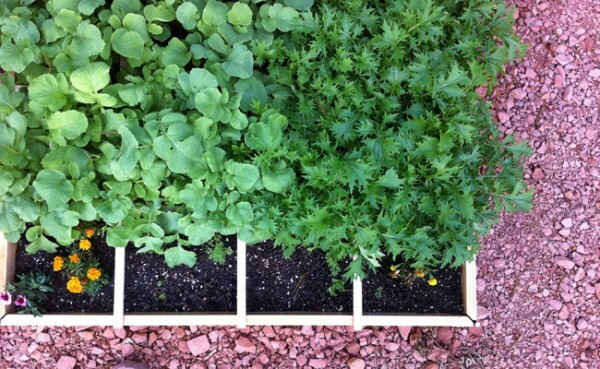 It’s called Square Foot Gardening. It’s easily converted to Square Meter Gardening and has been proven to work anywhere in the world. Why does it work in a 3rd world country? Because we teach a women to garden and then she teaches her children. It’s all done with the Square Foot system. It saves land, in fact very little land is needed. No machinery is needed, no fertilizer is needed, no tools are needed, no skills are needed, no knowledge is needed. Just a few regular old fashioned seeds are needed, and only 10% of the water of a Victory Garden is needed, yet it grows 100% of the harvest. Will that solve world hunger? It could – I think in 10 years. With probably 1 billion dollars. Then it’s solved – forever! Today we’re spending how many billions of dollars every year to cure illnesses and feed the hungry and help them out with their dilemma. The problem is the dilemma keeps continuing. We’re not doing ANYTHING – not one thing – to prevent all of this misery, we’re just there to help the people through the trial. You could compare it perhaps health. There’s two ways to be healthy. One is to prevent it, and one is to cure it. Medicine in the past has promoted mostly curing, and it’s a godsend – it’s wonderful. When you’re sick, there’s nothing like a doctor. Nothing like those pills and that medicine. But we’re gradually learning that you don’t have to be sick all of the time – maybe never! You can be healthy. If you learn how to eat properly, keep your mind in good order and avoid excess of everything, especially all of the sins, you’re liable to live a very long, healthy life. That’s what our method of SFG is all about. It’s how to be healthy, happy and non-hungry. The SFGF believes that EVERYONE in the world can learn how each individual can grow pretty much all of their own food in a very small space. Doesn’t matter where they live, what conditions there are, what their land is like, or what their circumstances are. Why, we can even put a SFG on wheels if they’re a vagabond or wanderer. I ask you to study this method with an open mind and an open heart and see if you don’t think that we can now solve world hunger. I would love to hear your ideas and thoughts. And please, sent this blog to anyone and everyone you know. Maybe someone in power will say “we could do this” and we can! And we will with your help and support. My wife bought your book because of my horrible gardening techniques…food going to waste…too many of this and that. I’m thoroughly enjoying your book and look forward to putting it all to work. Your blog has inspired me to learn all I can and to teach this method to others. I can get into this! Thanks for thinking out of the box! Thanks for the kind words, I really appreciate them. If you are getting into it right now, check out our contests and see if there is one that you qualify for! Mel, thanks for the post. I really like your big thinking and desire to help other people. How do you suggest others get involved in this movement? Hi Mel, great post,great idea! We are right behind you! What about allowing SFG-teachers to train people to become certified SFG-teachers over there so they can teach others? In this way the method will spread where it is needed most! We’ll be more than willing to help out in this way! Expansion sounds like an excellent idea. We have to consider quality control, but it would certainly make sense to have our certified instructors do much of the training. In order to combine your idea, why don’t we do something like this: have the other people sign up through our website, get the course and you become their coach? You could put the word out that you will coach 1+ in a class and they just sign up individually so that it’s official. They have the advantage of you being able to expertly guide them through the course and also ensure that they will be good teachers, especially on the stage. If we could arrange something like that, I would be very please to use that as an example for others and to reward you in some way that would be appropriate and to your liking. Give that some thought and let’s see if we can’t build on some of these ideas and come up with a plan. I’ll be anxious to hear back from you. Thanks again and best wishes. This post is in our newsletter today, so lots of people will read it I hope! Expansion is the key and qualitycontrol is very important. Qualified SFG-trainers who will get this permission will have to have proven already that they will deliver quality. About the course you offer already: great, but… for the future teachers in 3rd world this will be a huge amount to spent! And the course is in english. Even if they understand english the question will be if they can read and write it enough to follow it. Don’t you think these obstacles might stand in the way of rapid expansion and reaching your goal of solving the world hunger problem? Same goes for teachers in developed countries were english is not the main language. Thank you so much for your letter, Saskia, and you are absolutely right about expansion. Of course quality control is most important in any type of operation, whether it be a business or a non-profit and whether it be volunteers or paid staff. As far as the third world country, you are absolutely right about English. Now we can send people all around the world, going into third world countries. They know English, but they have to teach in a different language, so in the past we have selected people who did know that language or came from that country and could speak English as well. They could take our courses and become certified, but that doesn’t lead to rapid expansion as you mentioned. They are definitely a hindrance to getting this method out around the world and solving world hunger by showing people how to grow their own. Now we have taken steps wherever possible about getting all of our material in different languages. For example, when I taught at BYU I asked the students in one class how we were going to get this down in Brazil. One boy raised his hand and said, “I speak Portuguese very well and I’ll translate your video for you and we’ll dub it in Portuguese and I said, “Well, that is very good but I also have a woman in the video, Susie, and he said, “Oh, I’ll get my girlfriend to do that,” and sure enough they did and so we have the introduction to Square Foot Gardening done in Portuguese and also in Spanish. Then as far as the books, we’ve had many of my past books translated both into Spanish since we do so much work in Central and South America, we have an awful lot of our worksheets and handouts done both English and Spanish. Alan, one of our staff members, is from South Carolina and he speaks Spanish very fluently. He’s been back and forth to Peru and several other countries this past spring. He’s met with many of the big government officials and of course he speaks very fluent Spanish and able to talk to them. Then he is also translating everything we have into those languages but that doesn’t get us all the way around the world, just to another country. I’ve had several people in the past say, “I love your system so much I want to help and I’ll volunteer to translate whatever you want me to do to my language and then we will be able to distribute it here in my country and on your website.” And we have done that and the old website had the whole thing translated into I think it was 8 or 9 different languages; the 8 most prominent languages around the world. That somehow got lost and we are getting back to starting that all over again with a new website that is coming this fall. So, Saskia, I agree with everything you say and you’re right on track about that. We do find that wherever USA AID goes that most of the people that can help do speak enough English to get the idea across. We’ve also converted the into Square Meter Gardening and that is what we use overseas. One of the books I’m working on right now is going to be Square Foot Gardening to the Rescue and that will show how to solve 22 different world wide problems with Square Meter Gardening. That also will be translated into many different languages when it is published and distributed so if any of you out there speak another language, no matter where you live, and want to help translate, we would start with the trifold, which is right on the home page of http://www.squarefootgardening.org, and that’s easy enough. So write me if you’re interested in helping out and volunteering to translate into your language that would be great. We’d greatly appreciate it. Thanks Mel, for your answer. I missed the reply but I received your email so I answered to that. So you already know that we, Jelle and I, are most willing to help out! We’ll keep in touch (and hopefully meet this fall! ).